Other Ingredients: vegetarian capsule, l-leucine. 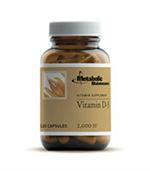 Physician monitoring of vitamin D levels is recommended. The 25-hydroxyvitamin D level is the main indicator of vitamin D status. Adults: Take 1 capsule daily with a meal as a dietary supplement, or as directed by a doctor. Rossi M, Ann Oncol. 2008 Aug 18.